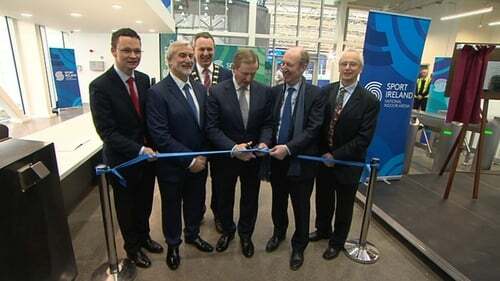 The new state-of-the-art Sport Ireland National Indoor Arena was officially opened today with Minister Shane Ross saying it will fill an "important gap in our national sporting infrastructure". The indoor training and events centre is situated at the heart of the Sport Ireland National Sports Campus and comprises a National Gymnastics Training Centre, National Indoor Athletics Training Centre and National Indoor Training Centre and is designed to accommodate over 20 sports. The indoor training and events centre will be complemented by ancillary spectator, changing, media and conference facilities. “This most impressive facility is a very welcome addition to Ireland’s sporting infrastructure and I look forward to the many events which the Arena will host of the coming months and years,” Mr Kenny said. “The development of the Indoor Arena with its tremendous indoor athletics track, world class Gymnastics Centre and expansive indoor training facilities fills an important gap in our national sporting infrastructure,” the Minister added. CEO of Sport Ireland John Treacey added: "We've got an indoor arena that's superb, it's world class without a shadow of doubt. "It really is a centre for elite sport, but it will also be for the greater Dublin area and recreation and people who want to book it. It will become the centre-piece for sport. Treacey hopes that there will be further development also and said: "It's cost €39m and we're hoping to do phase two which would be covered pitches for soccer, rugby and gaelic and a lot of other sports as well."